Purpose: Previous studies reported that hypertrophied superior articular process (SAP) was associated with an increased risk of lumbar foraminal stenosis. However, no study investigated the effect of SAP hypertrophy in lumbar central canal spinal stenosis (LCCSS). We hypothesized that the SAP cross-sectional area (SAPCSA) is the main morphologic feature in the diagnosis of LCCSS. Patients and methods: Data regarding the SAPCSA were collected from 109 patients with LCCSS. All patients were enrolled after the LCCSS diagnosis was confirmed by an experienced, board-certified neuroradiologist. All patients had clinical manifestations compatible with LCCSS. A total of 120 subjects in the control group underwent lumbar spine MRI as part of non-symptomatic medical examination. T2-weighted axial images were obtained from the 2 groups. 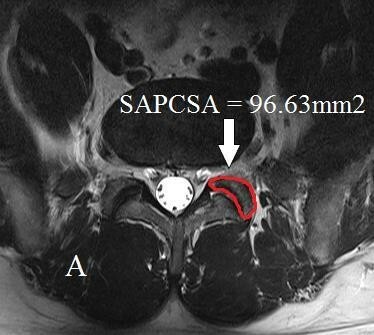 Using a picture archiving and communications system, we analyzed the CSA of the bone margin of SAP at the level of L4–L5 facet joint on MRI. Results: The average SAPCSA was 96.63±13.37 mm2 in the control group, and 123.59±14.18 mm2 in the LCCSS. The LCCSS group showed significantly higher levels of the SAPCSA (P<0.001) compared with the control one. Receiver operator characteristic (ROC) curve analysis was performed to determine the validity of the SAPCSA as a predictor of LCCSS. In the LCCSS group, the optimal cut-off-point was 110.71 mm2, with 83.5% sensitivity, 83.3% specificity, and area under the curve of 0.92 (95% CI: 0.88–0.95). Conclusion: Higher SAPCSA values were associated with a higher possibility of LCCSS. These results are important in the evaluation of patients with LCCSS.